One Postcard a Day: Cherry Blossoms About to Reach Peak Bloom in D.C. The National Cherry Blossom Festival is a spring celebration in Washington, D.C., commemorating the gift of 3020 cherry trees from Tokyo, Japan to the city of Washington D.C. First Lady Helen Herron Taft and Viscountess Chinda, wife of the Japanese ambassador, planted the first two trees on the north bank of the Tidal Basin in West Potomac Park on March 27, 1912. This weekend, the cherry blossoms are projected to hit peak bloom while the Annual National Cherry Blossom Festival Parade and the 55th Annual Sakura Matsuri Japanese Street Festival will attract a large crowd. Earlier today, USPS and Japan Post jointly issued the Gifts of Friendship Forever stamps on April 10, 2015, featuring cherry blossom trees and flowering dogwood trees, celebrating the enduring bond between U.S. and Japan on the centennial of the thank-you gift of flowering dogwood trees from the United States to Japan in 1915. Outgoing postcard US-3263842 to Japan shows the Washington Monument with cherry blossoms in the foreground. 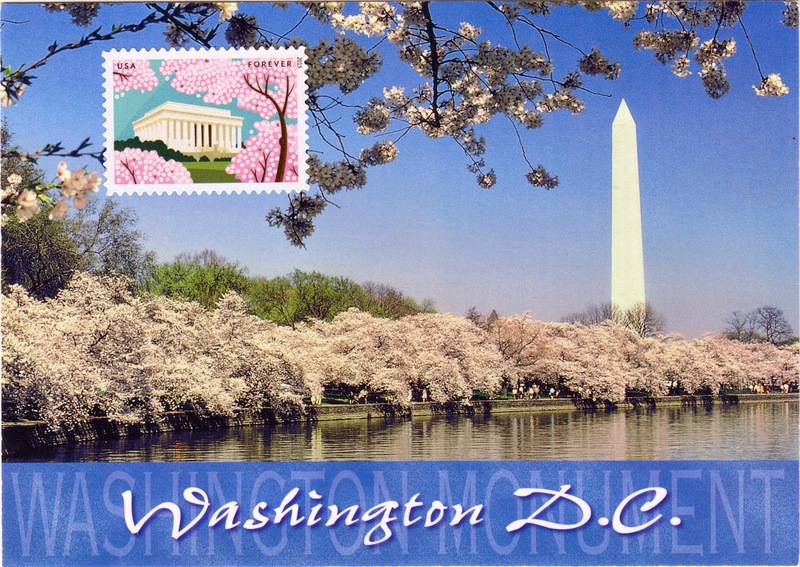 It has one of the Gifts of Friendship stamps in the front featuring the Lincoln Memorial with vibrant cherry trees.